H5963 has advanced in the House! If you received my earlier version of this same post, you’ll see the Bill number was incorrect. I’ve addressed that. I’ve also found out that I misunderstood exactly where HR5587 is. It passed the entire House by a vote of 405-5! The flurry of activity?! The House of Representatives is on ‘fire’ for their “Better Way” agenda. Leading that charge? Paul Ryan! A huge sold-out leader! Warriors Against the Core, so far, 2016’s federal overreach into education has been written quickly, promoted widely, and is set to increase the choke-hold on freedom as we know it. Why talk about these bills in D.C. which are in their ed/workforce committees? BECAUSE the bills SHOULDN’T be there AT all!! My point, Warriors?! EVERY one of the Bills you see above is toxic to America in HUGE ways! Warriors, we have the ‘writing on the wall’ before us. WHAT are we willing to do with it? As you can see in the graphic above, each of the Bills has the most basic of toxic components listed. But, know this: each of one them you see above has more ties than a centipede wearing tennis shoes! Here is a chart I prepared in August 2016 which gives you a side by side look at HR5587, S3271, S3190, and S3174. One for H5963 will need to be created, too. A problem is the LEGISLATORS want short and sweet (or ‘to the point’) pictures; one-half to 3/4 of a page in information! Which is a HUGE clue as to they are unwilling to conduct the due diligence which they swore to do. They should be not only willing to read the ENTIRE lengthy ‘saga-like’ bills being churned out, they should be doing it. IT’s THEIR JOB we PAY them for! We (Warriors) know several citizens who are DOING Congress’ job for them!! Why are our Congress members NOT jumping up and down, screaming with anger over the 100% illegal daily activities going on?! Why are our Congress members NOT staging protests or holding press conferences revealing the criminal (yes, seriously criminal) charges which should be being levied against each other (and quite possibly themselves)?! If a ‘regular’ American citizen conducted even a FRACTION of any of the illegal moves, they’d be under the jail! No, Congress is too busy NOT listening! Too much money is stuffed in their ears! The press conferences they are holding are to congratulate, not only, each other but every one of the supportive/sold out CCSS Machine members who helped ‘craft’ the Bills! WHEN CONGRESS DOES NOT TAKE ITS JOB (ITS ONE and ONLY JOB) SERIOUSLY, WHY SHOULD I TAKE THEM SERIOUSLY? If they’re not serious, why are they even there?! Because they’ve over complicated EVERYTHING, even the law. If they’d take the CCSS Machine’s money out of their ears, divorce themselves from the curried favors of the lobbyists of the CCSS Machine (or any person connected to it), THEY’D KNOW, “We the People” are their REAL Bosses! They’d recognize it is OUR voice with which they are to vote/protest/protect. They’d truly understand WE are to be respected, not manged like ‘village idiots’. As an example of the glee and glory with which the House of Representatives is using in celebrating the advancement of HR5587, they’ve proudly displayed the list of organizations who are in 100% support of the Bill. It’s a ‘no brainer’ to see how many of them are CCSS Machine member organizations. Which means, Warriors, our same old foes are pumping out propaganda left and right. Since they are most of the same CCSS Machine members/tactics, we should be easily able to defeat them! Don’t you wish they were as proud of our nation as they are of their criminal partnerships? Warriors, if you’d like to help rein in Congress, or know someone who does, share this. As has been said before, it’s up to “We the People”, we cannot trust or rely on those who have been elected and have jumped on the CCSS Machine. Women on the Wall and U.S. Parents Involved in Education are two such groups. I’m honored and proud to be a part of both. A dedicated Warrior has taken it upon herself to create a new Facebook page (honoring my work looking into these Congressional bills) where you can help rein in Congress. I CANNOT do this ALONE nor SHOULD you! One of us is easily marginalized. Many of us might be discounted, but a lot of us, will get their attention. We MUST be LOUDER than ever! We MUST not be polite..it’s a fight, not a Sunday dinner. We MUST protest in their backyard (which we pay for them to use). We MUST be truthful, our nation has suffered enough with the lies. Please, help me, help you by listening out, watching out where these (or any other related legislation) Bills are concerned. We MUST be pro-active, not reactive. Help our nation and our students by taking whatever strikes your heart the most when you read the articles below and create screen shots, charts, memes, or whatever will help get this life-saving message of our out there! Warriors Against the Core, what do you get when you take an at-home ‘teachable moment’ and add digital badges?! You get a CCSS pot stirring lesson. Look below and see if you can see the hiding-in-plain-sight CCSS/STEM themed agenda. What you see above is from the name brand “Uncle Ben” rice. The cooking with your family concept is wonderful. It’s part of how we bond. It’s a great way for parents to guide their children. However, not everything connected to education needs an agenda. So, IS there an agenda to the Uncle Ben’s current project?! Let me pause here to say that I think teaching kids to cook is absolutely vital. My concern is as always, is there more just under the surface we should know? For example, is Mars Food North America a CCSS backing company? Is the ‘Homework Direct’ service featured in the video a real service? Is the “Ben’s Beginner Program simply a way to teach cooking, or is there CCSS or any of its related alignment present in the Project? Mars Foods (aka Mars, Inc.) is a global company. They make more than rice and candy, however. Pet foods are among their products. They also are the company behind Banfield Pet Hospitals and many other products/services. For all the promotion are expected to do in the picture above, all you get for motivation is coupon worth less than $3.00! As far as the question about “Homework Direct”, as featured in the Uncle Ben’s video, there is NOT a real service that I could find with that logo or tied to Mars. I did find several services with that name, however. The biggest one is from the United Kingdom. I didn’t find any connections, though. Finding ‘Ben’s Beginnings’ in your school district’s budget: I found the Mars/Uncle’s Ben’s Project in a FL public school 2013-14 budget. Pasco County, FL Warriors, take note! Pasco’s 2014-15 Budget included the Ben’s Beginnings again. Same General Fund (CCSS comes under that General Funding, too), same account number. Page 30, though. You won’t find “Ben’s Beginnings” exclusively in FL, just like CA is not the only State the Wrigley Foundation’s overreach in the classroom can be found either. Since Mars, Inc. is connected to Uncle Ben’s and Wrigley’s Foundation, it’ll continue its quest for global CCSS/STEM/CTE alignment. Who knew a pot of rice could contain so much agenda? Anti CCSS/ESSA and Fed Ed Warriors, schools are beginning to open for the new year (2016-17). We are beginning to see the first tentacles of the ESSA (Every Student Succeeds Act) reach down from the national level to the state and local levels. Much of it will NOT use the phrase “Common Core State Standards”, but instead “College and Career Readiness”. We have been alerted to this fact well before now. However, how is the CCSS Machine spinning the ‘newness’ of the same old agenda?! That by conducting education any way BUT the ESSA way, is to “breed inadequacy”. According to the CCSS Machine member organization “Getting Smart”, by 2020, 65% of all jobs will require post-secondary education. FEE also has a short video to support how inadequate education before CCSS was and how heavy the changes for CCR (via STEM, dual enrollment, AP and IB courses, and CLEP exams (College Level Examination Program)). Every one of these ties in some way to not only CCR (College and Career Readiness) but can be found in the ESSA, the WIOA (Workforce Innovation and Opportunity Act) and the HEA (Higher Education Act) as well. The sheer fact that FEE is using the ACT, Inc. assessment as one of its OTHER solutions for College and Career Readiness is also a clue for us. How? Act, Inc. owns “WorkKeys” assessments. “WorkKeys” is the Competency Based Education, Career Pathways test which sets the course for what job your students should not only be trained for, but educated in! Those CLEP assessments? Those are owned by the College Board, Inc., yet another CCSS Machine key member organization. Awww, Warriors, aren’t we ‘honored’ to have such bias help?! (I am being 100% sarcastic here). Let’s look at the statement above from the Warrior’s side. a) To be truly State led (as ESSA was sold to the nation), why would we need a national group’s help in making decisions? b) Does the FEE and other CCSS Machine organizations just assume the States are too stupid to identify funding for themselves? As mentioned above, this is an initiative project of FEE’s but it is not solely FEE’s. So who is on the DLC (Digital Learning Council)? So, the better question (anti Fed Ed/ESSA/CCSS Warrior) should be: what CCSS Machine members are breeding inadequate education? A few days ago, I shared with you all kinds of ‘ACTions’ being taken in regards to shifting American education to national credentials with international data collection. At the close of that article, I also shared we would take a closer look at the Envision entity (that is the international data collector). If you are a bit confused, do not fret. Quite simply, Act, Inc. has several workforce/competency education based assessments that are becoming increasingly prevalent in not only education (some states as young as 3rd grade), but employment centers as well. The goal? Aligning your skills with a path of work. Where Envision comes in is helping match people with jobs all the while collecting, sorting, and sharing their data across the globe. Why? Global workforce. Remember, the Envision portion is supposedly so you can become a better you. The mission: ‘POP (Power of Potential)’ is their short answer. Looking a bit deeper, however, you will find the same old pro CCSS/CBE (Common Core State Standards/Competency Based Education) rhetoric: digital learning which is personalized, gives the best critical thinking, promotes collaboration, AND helps Johnny and/or Suzy change the world! Sign up and your student can have all this learning wrapped up in FUN, too! For the record, Envision is known as Envision EMI and is a LLC which is privately held AND for profit. This is according to the Better Business Bureau. I am including the link to show you the other names Envision has gone by. See if you recognize any of them. So, who owns Envision EMI? Gryphon Investments. Why would we need to know about Gryphon Investments? The CCSS Machine is BIG, and is loaded with money. Follow the money, find the agenda, and locate the participants. Gryphon is a private equity company. Many private equity companies, as well as, venture capitalism companies are already hard at work helping the CCSS Machine with education reform, right under our noses. They also know data collection/sharing/selling is a hot commodity. Now that you have a good idea of the KIND of entity Envision is, let’s see how they are shaping our students. Remember, according to the website, the ‘fun learning’ begins in 3rd grade. Through programs with the NYLF alphabet soup-like title in front of the descriptions. NYLF stands for ‘National Youth Leadership Forum’. See the screen shot below and notice the NYLF topic for STEM, (Science, Technology, Engineering, and Math). The NYLF topics in Middle School add to the STEM and include politics. Dig deeper, and you will find CCSS Machine members/groups guiding the discussions surrounding politics, as well as providing the classroom resources. Since all this effort is being put into global workforce, global education, and global citizens, let’s see what CCSS Machine member organizations are behind the NYLF Global Leaders topic, shall we? Oh my, Warriors, one of them is Harvard University! How have I proven Harvard is in bed with the educational reform and the CCSS Machine? In one word: Pearson. In a few more words, their joint project called Pathways to Prosperity, which helped birth the global career pathways and tracks we now have. Here is a screen shot of the press release linking Envision, Leadership, and Harvard. Warriors, do not get me wrong, there is nothing wrong with addressing human needs. We have been doing so since time began. However, as I have stated before, when EVERYTHING is run through the CCSS Machine of ‘global this’, ‘global that’ and for the ‘collective good’, it is enough to make you scream! Why? Collective thinking kills individualism. Global everything keeps the focus away from your immediate environment and forces you to not only look outward, but take it all in as acceptable. Consider how the brain develops. Not everyone can understand ‘collective globalism’ at an early age OR if their development inhibits their understanding. As the brain develops we DO understand immediate environment, we are geared to create close relationships. Common Core, College/Career Readiness, Career Pathways, STEM, STEM Pathways don’t work because they go against the natural flow of not only our thinking, but our way of living. As a result ANYTHING connected will alter our lives as well. 1) The CCSS Machine agenda ruins not only education, but quality of life. 2) When your national and local levels of government knowingly (or unknowingly) endorse, support, or instigate the efforts of the CCSS Machine, they might as well as find themselves sitting in a corner of their offices! 3) Instead of each person being the best they can be, the true CCSS Machine vision is for collective good where personal best cannot exist. 3) Think ‘Martin Luther’ and grasp his ire at the church which inspired him to find 95 truthful facts and nail them to the door. 4) Think the ‘Apostle Paul’ and his thorn in his side. He didn’t let the pain it caused stop him. Embrace that spirit of ‘never quit’. 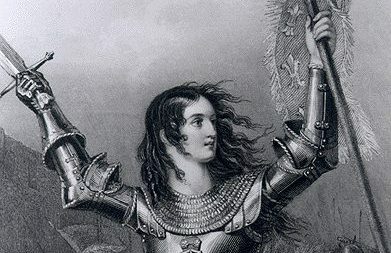 5) Think ‘Joan of Arc’ and her willingness to die for what was true, good, and right. Re-enact her fierce stare, her defiant stance, and her strong voice. So, which Warrior will you become? What mindset will you adopt? What bottom line will you erase as a result? We, those opposed to the CCSS Machine, are their thorns; their truthful witnesses; their worst nightmare. We, those opposed, will NOT give up, never surrender our freedoms. We, those opposed, outnumber them. Coincidence? Hardly. Recently, anti CCSS/ESSA Warriors, the CCSS Machine organization known as Act, Inc. (think high stakes assessments, data mining, and workforce based alignment) published a paper about the ‘soft skills’ education alignment MUST include if we are to have employable students. It is the 2016 National Curriculum Survey (more about this later). Many researchers, like myself, have been sharing with you over the years how the CBE (Competency Based Education) is a huge component of the illegally based education reformation we are witnessing. The evidence is plentiful, so I will not waste our time rehashing CBE’s roots. I would like to point out to you this recent publication so we can see just how MUCH more propaganda the CCSS Machine has spun in regards to ‘soft skills’ and how ONLY the Common Core/ESSA (Every Student Succeeds Act)/HEA (Higher Education Act)/WIOA (Workforce Innovation and Opportunity Act) can do it all! From the Act, Inc. 4 page document promoting how great a national workforce based credentialed system is and WHY everyone should be involved, is in the screen shot below. Note how the data base of skills is ONLY available at Act, Inc.
What does this have to do with ‘killing’? When we stop educating people to do what they desire and rely on skewed tests which align us to learn what the CCSS Machine demands, we KILL the love of learning. This 4 page document is geared for the students and refers to them as ‘Career Seekers’. Act, Inc. has also published another 4 page document for educators and how THEY can make sure students are CERTIFIED for workforce based national tracking! This document informs us that there are 3 nationally based assessments students must take; that their scores to be workforce ready must be certain numbers which also translate into platinum, gold, silver, and bronze levels. As educators, we are ‘killing’ our students spirit with alignment like this. Think about it, our students (of ALL ages) will not be as recognized for WHO they are, but WHAT level of certification they have! Warriors, Act, Inc. also has a document explaining how they have studied all this workforce based/competency based education. They wax on about the case studies, the need for alignment, the ease of it all via data mining. As part of the alignment, Act, Inc. has a self assessment we can take called, Act ‘Engage’. When I take this self assessment and COMBINE it with the other Act, Inc. workforce based assessments, I become part of a global workforce skills based company’s database called Envision. See for yourselves, below. Notice how early this alignment is starting, notice the personalized learning component, and yes, the data mining. Look below at this screen shot. Notice how Act, Inc. is stating that for the first time workforce stakeholders were included in the National Curriculum Survey!! This almost 90 page document is full of CBE information! It is full of all kinds of ways education is being made over with workforce as the ultimate goal! Act, Inc. also states, in this report, that the College and Career Readiness Standards are theirs. Throughout the ESSA, you will find the phrase ‘college/career readiness’. It has been reported by other anti CCSS/ESSA Warriors that the ACT test is also being considered as one of the 2 national assessments that would replace the SBAC and PARCC. Think this is all a coincidence? It certainly doesn’t seem that way to me. Notice that the Campaign includes policy and government relations. That means Act, Inc. has a front row seat in Washington, D.C.! Notice the States and leaders from those States tout how great Act, Inc.’s College/Career Ready efforts are. Warriors, find out how far down the Act, Inc. alignment path your State is. What legislation does your State have for Workforce Development? Is your State aware of the ties to the CCSS Machine with the College/Career Readiness?